The Furukawa HD700 series drifters are designed to minimize drill noise and vibration without sacrificing performance. Incorporating a new piston design, the HD700 series drifters maximizes energy transmission and drills effectively in a variety of rock types. The HD700 series incorporates all-hydraulic controls for automatic adjustment of impact and feed force to accommodate changing rock conditions. A reactive dampening control system regulates the pressure based on rock hardness, providing superior drilling performance. FRD has developed the Dual-Damper System, a first in the industry. For maximum energy transfer, active DDS minimizes the return of shock waves by keeping the bit firmly against the rock at all times during drilling. It also minimizes percussion energy loss, and by optimizing the overall feed force, greatly improves the life of drilling accessories. An additional benefit is the greatly improved life of drilling accessories. Active DDS (U.S. Patent No. 5,896,937). A compact shuttle valve minimizes loss of oil pressure and maintains total power output of the drifter. Combines powerful penetration with agility and easy operation. 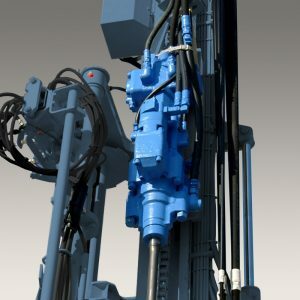 Integrated drilling system is comprised of all-hydraulic controls and a reactive damper control system, which work together to accommodate changing rock conditions. The hydraulic controls automatically adjust impact and feed force, while the damper control system regulates pressure based on rock hardness. Dual damper system maximizes energy transfer to produce straighter holes. Compact valve design provides rapid valve and piston response for enhanced performance. Rugged, dirt-resistant in-line shuttle valve requires little maintenance. New variable-stroke piston is designed to maximize energy transmission, delivering optimum drill performance in a variety of rock types. Unique dual-damper system provides straighter holes and increased drill tool life. Internally lubricated front-head means no oiler to fill and no bearings to grease.